Writtle University College - Silver win in Ideal Young Gardeners of the Year! Silver win in Ideal Young Gardeners of the Year! Writtle College students are celebrating after winning silver in the Ideal Young Gardeners of the Year competition. 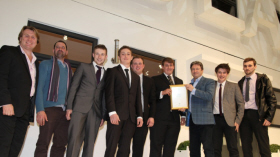 TV gardener Alan Titchmarsh – who is also Writtle College patron – presented the team of six Further Education students, who are studying for Level 3 Extended Diplomas in Horticulture, with the award at the Ideal Home Show 2013. The team comprised of Matt Jones, 19, from South Woodham Ferrers; Joe Pratt, 18, from Cold Norton; Jake Lovick, 19, from Rettendon Common, near Chelsmford; Sean Ricketts, 19, from Chelmsford; Will Pryslopski, 18, of Stondon Massey, near Brentwood; and Ben Snow, 21, from Witham; along with Writtle College staff Ben Wincott and Simon Watkins. The competition, organised by TV gardener David Domoney, formed part of the 105th Ideal Home Show, which was at London's Earls Court until 1 April. Run in association with the Prince's Foundation for Building Community, it celebrated young 'green' talent in the UK. Six horticultural colleges go head-to-head each year to create a show-stopping garden for public display based on the organic and sustainable principles that the charity's President, HRH The Prince of Wales, has championed for so long. Each college was given a 5.5m x 4m plot to both plan and design a unique and sustainable garden based on the theme of 'sustainable urban gardens’. This year, for the first time, the show gardens were built inside the heart of the Earls Court show. As well as the willow fencing, Writtle College’s entry featured bull-nose paving in York stone and a pond. The college gardens were viewed by hundreds of thousands of visitors at the iconic British show.